Note: This is the original page for this species, from before its true identity was known. 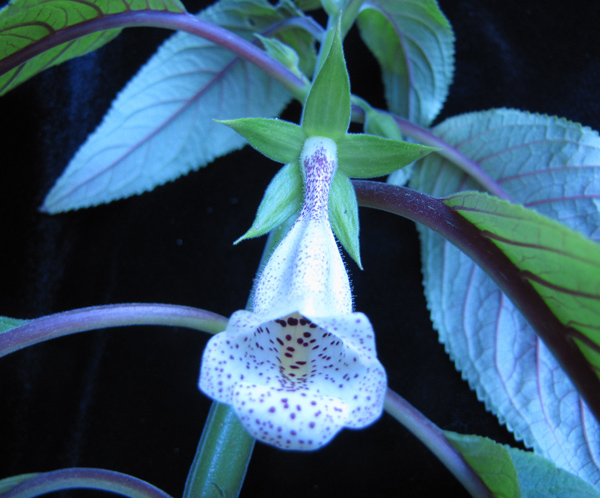 For updates and more information, see its true name: Sinningia gesneriifolia. This plant was grown from Brazil Plants seed. Even when very small, the leaf pattern was striking. The plant in the picture is about 5 cm [2 in] tall. 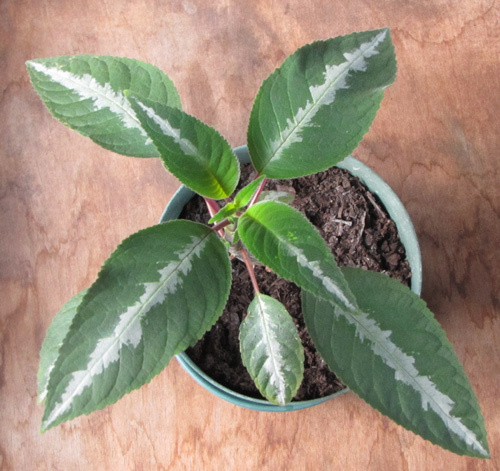 Some varieties of Sinningia reitzii have a dramatically patterned leaf when young, but lose the light center stripe as they age. It appears that this new species might have the same behavior. The plant also has another characteristic shared with Sinningia reitzii, namely dropping the lower leaves as the stem grows. 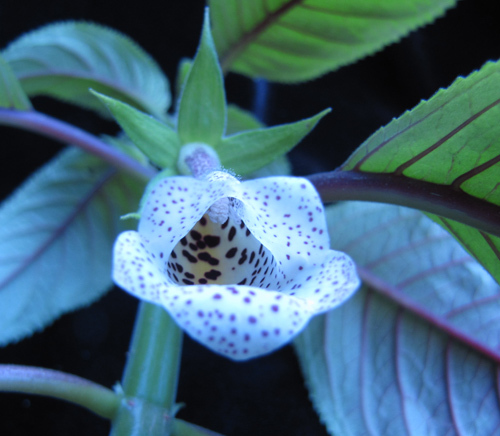 Mauro's web site (link at bottom of page) shows this as a Paliavana, and this is quite plausible, since the flower bears a lot of resemblance to that of Paliavana tenuiflora. The patterning on the leaves disappears as the stem ages. 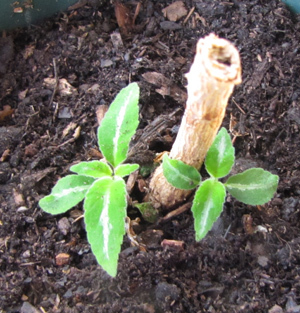 However, if the plant is cut back, the leaves on new stems can show the same patterns as seedlings. This photograph picture was taken at the beginning of June 2013, about three months after the previous picture. The pot is five inches (about 13 cm) in diameter. 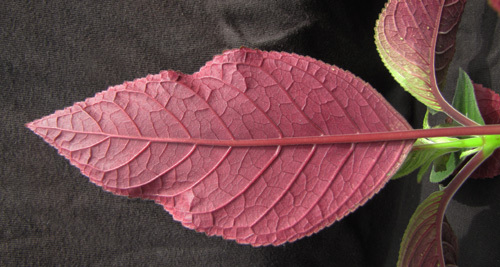 This shows the maroon color of the leafback, another similarity to a young Sinningia reitzii. Note that this plant is not close to Sinningia reitzii in the tribe Sinningieae. The resemblance is due to convergent evolution acting on similar resources. "São Fidélis" does not appear to have a tuber. 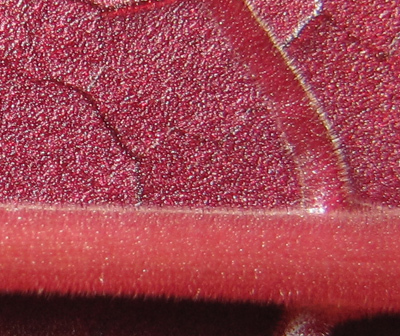 Here is a closeup of the leafback, with part of the midrib, one main lateral vein, and a bunch of shiny dots, the nature of which I would know if I knew more botany. The winter of 2014 was rather cold in northern California. That's when it was discovered that this plant could not tolerate 28 F [-2 C]. The picture at the left shows the result. This plant did not recover from the damage. However, another plant which died back to the base did revive in the spring. 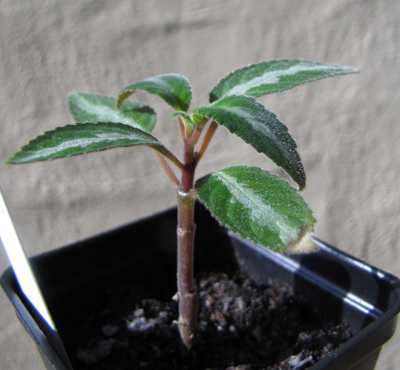 It is interesting to note that the new leaves had the juvenile striping that the mature plant had lost. See picture to the right. The flower has dark purple spots deep in the throat. It is not robust enough for bat pollination, so presumably the spots attract some sort of bee or fly. The flower does not have any scent that I can detect. The spreading calyx lobes are reminiscent of those of Sinningia speciosa. Feature table for Paliavana "São Fidélis"
Leaves Green with white stripe when young. Leafback maroon. 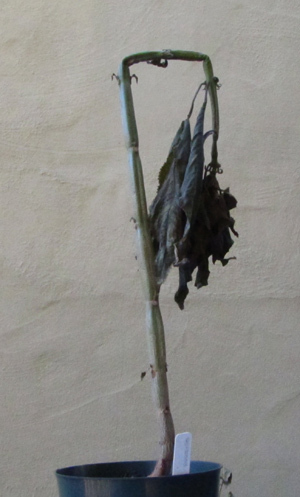 Dormancy Plant does not have a tuber. From seed To flowerbuds, 2 years, but this included the winter setback described above. Recommended? Certainly, it's attractive when less than 30 cm [12 inches] tall. At this point, I don't know how long it will take to bloom and how big the plant will be by then. I suggest pinching, in hopes of keeping it compact. So far, culture seems easy. Taxonomic group Sinningia clade . Mauro's Brazil Plants web site has a page. Mike Kartuz offers this plant. See this page for pictures.